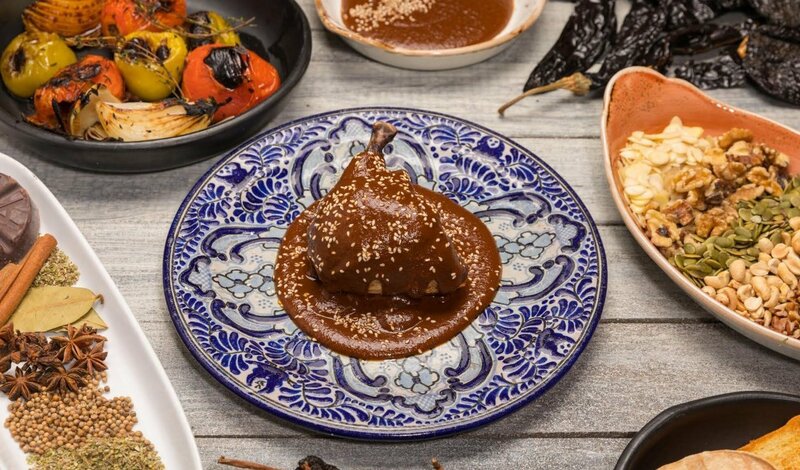 There are many different types of moles all over Mexico, but this Mole Poblano, from the city of Puebla, is one of the most popular. It has chocolate as one of its ingredients, which is one of the characteristics that sets this mole apart from the rest. Mole should be made with patience, and following the tradition of peeling nuts, roasting chiles and drying fruits. It is a very complex sauce, but the result is an unparalleled symphony of flavors. Clean the chiles and toast them in the oven until fragrant about 8 minutes. Place the chiles in a bowl and cover with boiling water, soak for about 15 min and drain. In a sheet pan, roast the onion, garlic, tomatoes, tomatillos. In a large skillet, toast the almonds, peanuts, pumpkin seeds, pecans and walnuts. Toast the tortillas, pambazo bread directly in the oven until dry and crispy. In a small skillet, toast the cloves, anise seeds, coriander seeds, peppercorns, cinnamonand thyme. In a large stock pot heat the prepared Knorr® Professional Liquid Concentrated Chicken Base and add ALL the ingredients (except the vegetable shortening) and simmer for about 10 minutes. Season with a little bit of salt. Then transfer the mix to the blender and puree in batches until all the mix is smooth. In a very hot large casserole heat the shortening and pour the "mole" mixture making it "screech". After you have pureed the mole and it is smooth, in a very hot casserole with very hot oil, we add the mole and the sound it makes is "screech". It needs to be extremely hot before you sear it or fry it, if it does not make a sound the oil and heat were too low. This step is used as a cooking technique in Mexico, the purpose is to awaken all the melded flavors even more. The layers of flavors are amazing even before this step. After this step, all the flavors come out stronger, especially the dried ingredients like cinnamon and pepper and the oil comes out and separates from the sauce. This oil comes out the color of the mole, in this case, is a reddish-brown with amazing flavor. Stir the mixture often simmering for about 1 1/2 hours until is thick and you get "mole oil".